There’s an enthusiasm gap. Typically, but not always, Republicans vote at higher rates than Democrats in congressional elections. And at this early stage, that seems likely to happen again, perhaps at an even greater rate than usual. One telling indicator came in December, when the Pew Research Center found that Republicans are much more optimistic about their party’s electoral prospects than Democrats are. 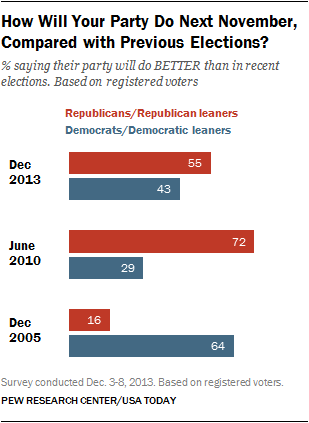 Fully 55% of Republican and Republican-leaning registered voters expect the GOP to do better in 2014 than the party has in recent elections, while only 43% of Democrats expressed such confidence.